They still exist: the well-thought, functional everyday products that are pretty in design, yet better and more refined than other design furniture: Consistently minimalist and clear design make the Sigmarail CD rack system a classic designer piece with a Bauhaus style and the perfect addition to your designer furniture. Sigmarail is a lifestyle choice. A CD Rack for Lovers of Bauhaus Design The artistic covers of your favourite CDs finally get the position beside your designer furniture that they deserve - on the Sigmarail CD rack. Simple, clear shapes make it a feast for the eyes and your CD collection a small artwork, a unique interior design idea. 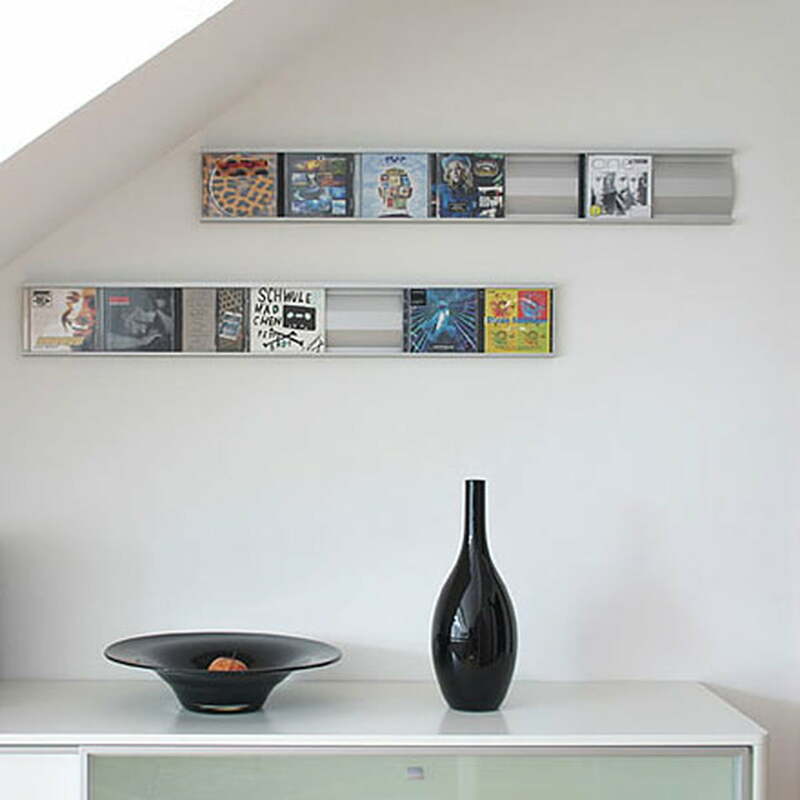 With its timeless design, the CD rack system is a modern representation of Bauhaus design - the design style that has brought us countless furniture classics and designs. an insider accessory for knowers and lovers of timeless design and high quality. Patented Functionality Makes Usage a Pleasure Designer furniture often looks good yet doesn’t function quite as well. Our Sigmarail CD rack system is different.Its unique tilt feature is patented and makes usage child’s play:you can easily take your CDs from any place in a few seconds - without fiddling or having to move the other CDs on the rack.On top of the single track for 7 CDs offered here, there is also the smaller Sigmarail Aluminium CD rack system - SR5 for 5 CDs. 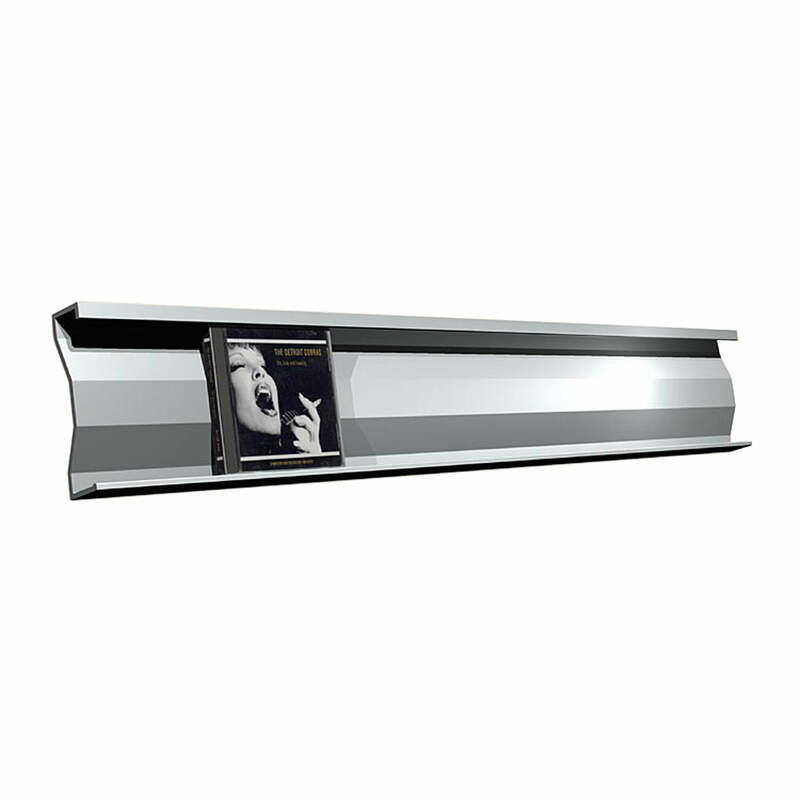 Frontal single image of the Sigmarail Aluminium CD Shelving System (SR7) with a single rail by Lowkon. The CD shelf is suitable for style-conscious storing of up to 7 CDs and is manufactured of aluminium with a fine, matt glossy eloxal-layer. Single image of the Sigmarail Aluminium CD Shelving System (SR7) with a single rail by Lowkon. The practical and shapely CD shelf has the dimensions 13.6 x 2.9 x 100 cm (H x T x L) and is therefore, suitable for style-conscious storing of up to 7 CDs. Consequently reduced design and smart mechanics are characteristics of the CD shelfing system Sigmarail by Lowkon. 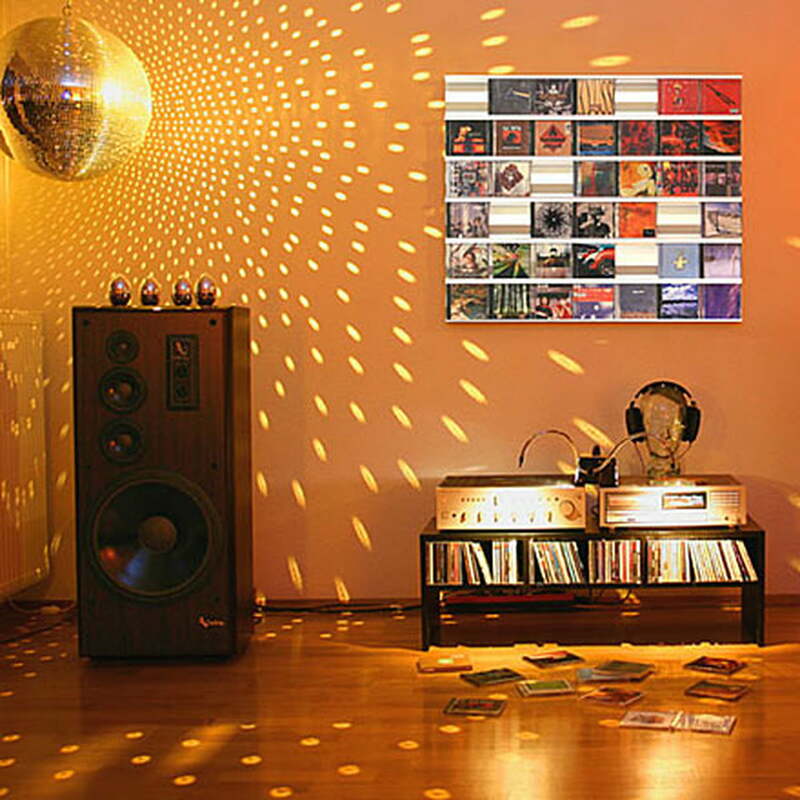 With Sigmarail, your CD collection becomes a piece of art and a unique decorating idea. Combining severeal single rails of Sigmarail, artful pictures can be created. Artful covers of your favourite CDs will finally get the position they deserve - in the CD shelf Sigmarail by Lowkon for storing up to 7 CDs. 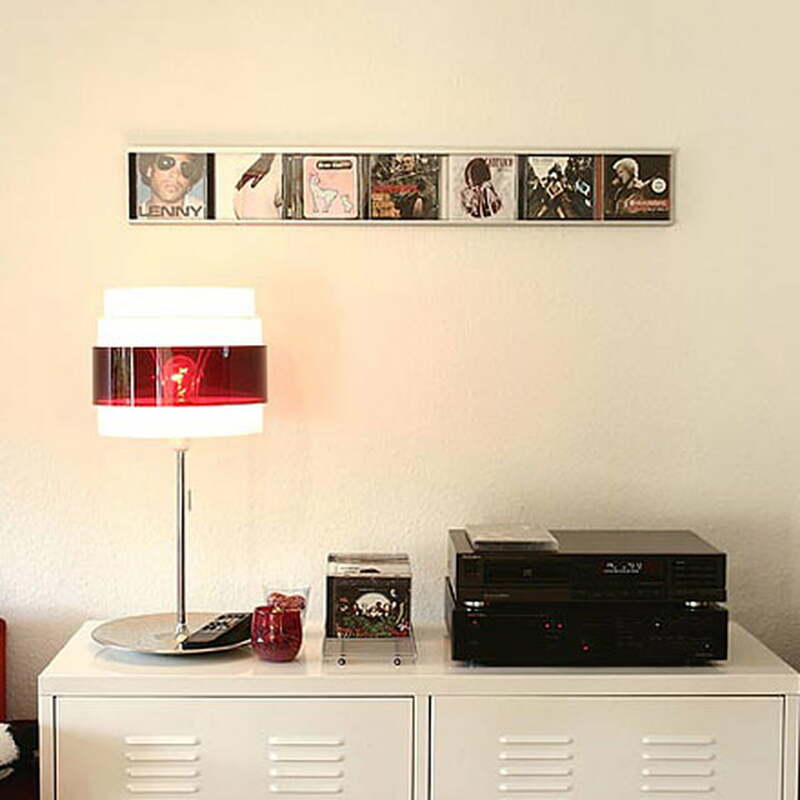 Simple, clear forms make it an eye-catcher and your CD collection a small but style-conscious artwork. Sigmarail by Lowkon is a CD shelving system with simple elegance and perfect function. 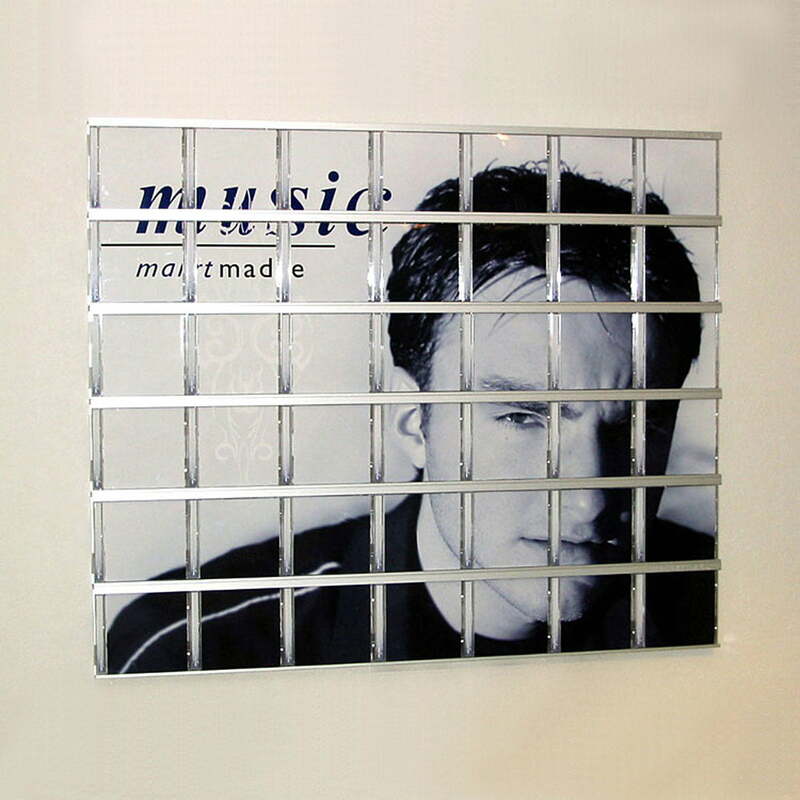 Arranging 6 single rails one above the other, a truly piece of art is created out of your favourite CD covers. The unique inclining function facilitates fast removing of specific CDs. 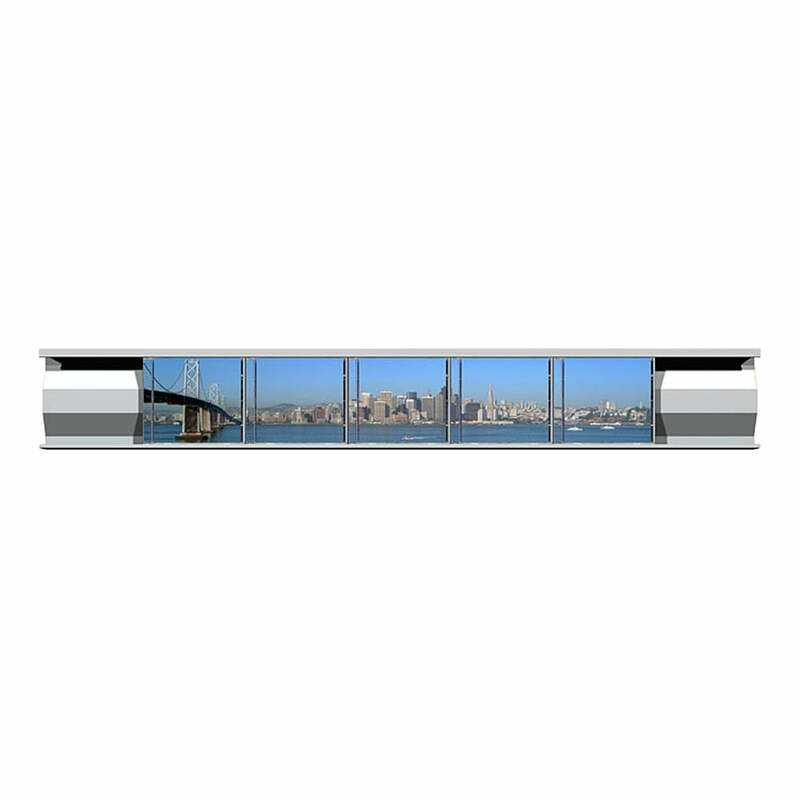 Arranging two single Sigmarail shelving systems by Lowkon one above the other, a stylish picture is created – even below the pitch of the roof. The shelving system stores up to 7 CDs and is the perfect addition to your design furniture. The exceptional inclining function of the Sigmarail Aluminium CD Shelving System by Lowkon is patented and makes the usage as easy as possible: with only one hand you can comfortably take CDs out of a desired shelf without moving other CDs from the shelf. 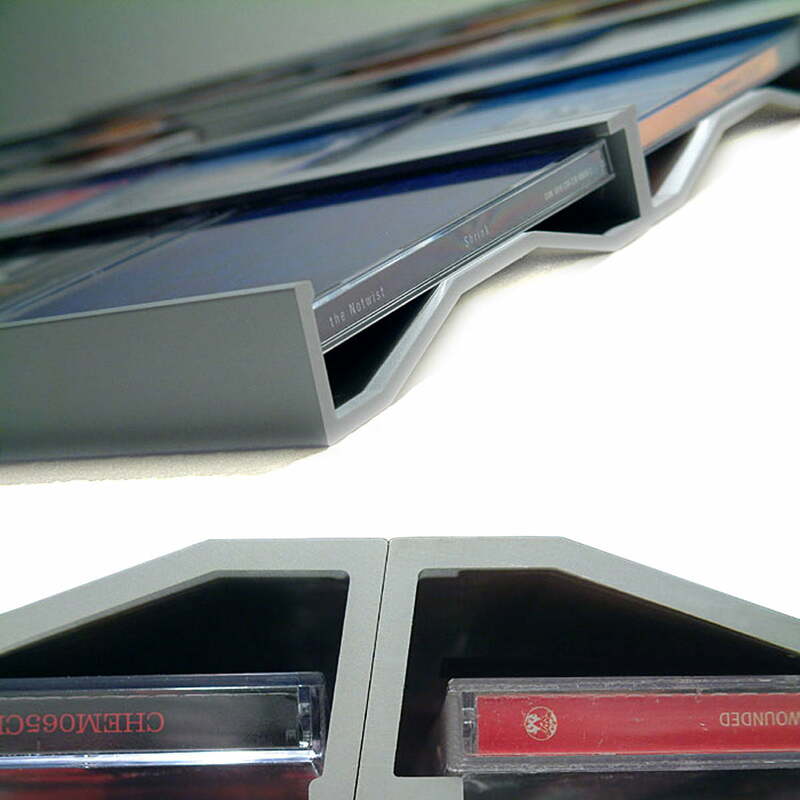 Detail image of stuck CDs in the Sigmarail Aluminium CD Shelving System (SR7) by Lowkon. 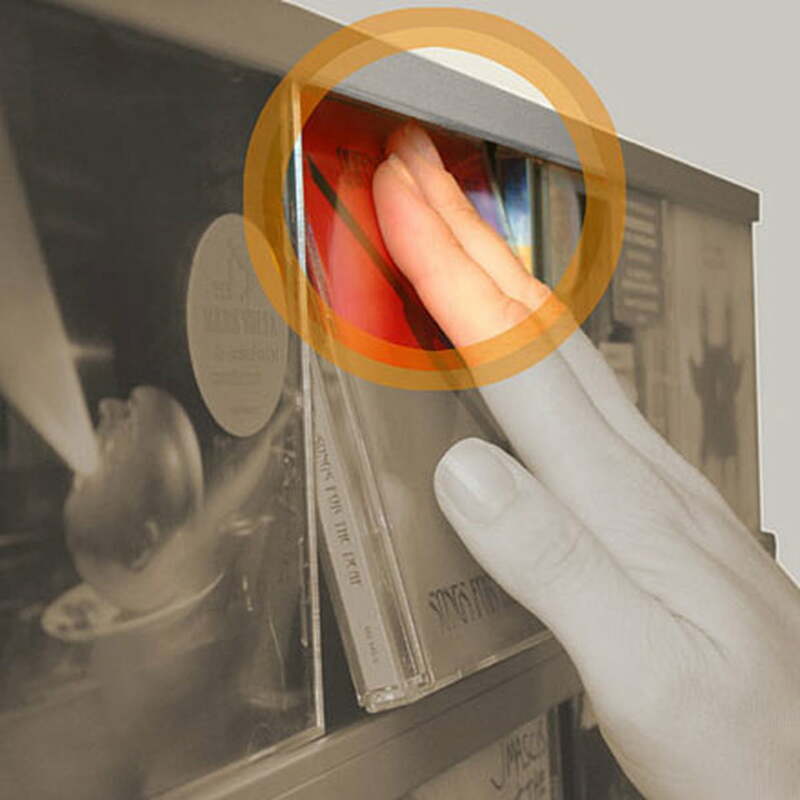 Its exceptional inclining function is patented and makes the usage as easy as it could be: with only one hand you can comfortably take CDs out of a desired shelf position.